October will officially start the anticipation of Halloween, and this year Americans seem to be particularly excited about its arrival. 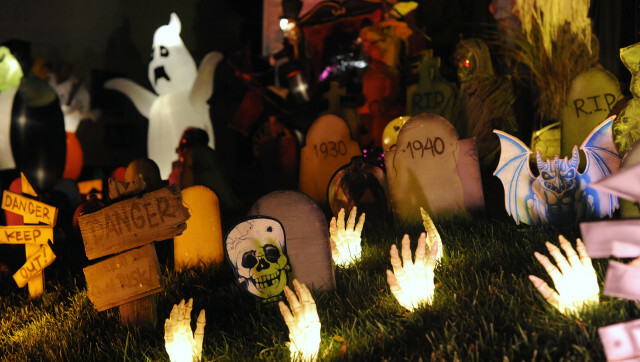 According to a new survey by the National Retail Federation, Americans will spend an estimated $8 billion on Halloween decorations, costumes, candy and greeting cards. Of the record 170 million Americans who said they will celebrate the holiday, 51.4 percent plan to decorate their homes/yards. The survey states 22.2 percent are going to use decorations from previous years, while those who do plan to buy new will each spend about $32.35 or a combined $2.36 billion. Although 45 percent will dress in costumes, surprisingly out of the 237,657,645 adults surveyed, only 7.1% will find inspiration from Pinterest. A majority say they will get ideas from stores. We were especially shocked to see Christmas decor being stocked on shelves of retailers practically everywhere before summer was even over. And according to the President of NRF, Matthew Shay, Americans are spending just as much time preparing for Halloween as they do for Christmas. “By the time Halloween rolls around each year it’s safe to say Americans have already spent two months preparing for one of the fastest-growing and most widely-loved holidays of the year,” he said. Well, we look forward to seeing all of the amazing Halloween decorations, DIYs and candy that will be out in full force this year. For more information about the survey, head over to the National Retail Federation.